This Week in Drama: Louise Linton, Caroline Kennedy, and a Controversial CakeWe recap the pettiest squabbles, juiciest feuds, and other niche drama you didn’t know you were living for every week. Caroline Kennedy Finally Sworn In As Ambassador to JapanAfter years of speculation. The Senate Also Confirmed Caroline Kennedy As Ambassador to JapanAfter the shutdown vote. Caroline Kennedy Finally Nominated as Ambassador to JapanHooray! Caroline Kennedy Is a Very Attentive JurorShe wants you to stop waving that photo, please. Caroline Kennedy Will Be Ambassador to JapanJapan it is. Today in ‘Caroline Kennedy May Be Named Ambassador to ______’Japan! Contents of ‘Explosive’ Jackie O. Tapes Under Debate [Update]JFK had an intern, so she had a movie star. Governor Paterson Off the Hook for Caroline Kennedy MessWell, actually, not really. Johnny Depp Is a Really Good TipperPlus, Seth Rogen is back on carbs, Katy Perry really loves pizza, and more need-to-know celebrity information for waiters (and everyone else), in our daily gossip roundup. Caroline Kennedy: I Didn’t Drop Out Because of KidsThe former contender to replace Hillary Clinton in the Senate says it wasn’t an intervention by her kids that led her to step out of the race. Madonna Stole Rihanna’s BootsThis just seems unfair. Hasn’t she been through enough? Paterson-Kennedy Mess Not OverAnd yet it seems so long ago. How Did Paterson Get to 26 Percent Job Approval?A handy interactive chart. Paterson Feels First Heat of Kennedy RevengeOut of allegiance to Caroline, Charles O’Byrne won’t return to help his former boss. Caroline Kennedy to Saturday Night Live?Spotted: Caroline Kennedy and Lorne Michaels, deep in conversation. Sulzberger’s New Girlfriend: ‘There Is Only One Woman in Arthur’s Life’The Gray Lady, duh! Paterson Nixes Davos Trip As Poll Numbers DipAndrew Cuomo is gaining on the Guv. Is It Now Open Season on Caroline Kennedy?By leaving on a mysterious note, she’s bringing weeks of scrutiny upon herself. The Latest Theory: Caroline Pulls a GeithnerThat’s right, the old taxes-and-housekeepers thing. Not So Fast: Ted Kennedy Insiders Already Annoyed at CarolineEven the hint that she stepped down because of his health has gotten some people peeved. Kennedy Aide: It’s Personal, But Not About TeddyLet the wild speculation continue! Why, Caroline? Why?! Pundits SpeculateUncle’s health? Saving face? Cold feet? Tell us! Caroline Kennedy Throws Media, Paterson Into a TizzyBut after a night of confusion, it looks like she’s out for real now. Caroline Kennedy Withdraws Senate BidBecause, you know, we were in a bidding war. Rivals: Caroline Kennedy Is ‘Certain’ Paterson PickBecause, let’s be honest, at this point it would be embarrassing if he didn’t. People Want Cuomo, But Think Caroline Will Get ItDavid Paterson has to be rocking his head in his arms over this. Andrew Cuomo Is Still In ItSuddenly, as Hillary’s confirmation draws nigh, the attorney general is everywhere. Kennedy Surpasses Paterson’s Low, Low ExpectationsSpeaking with Paterson did not eliminate her from contention. Well done! Sarah Palin Wants to Be Bitter About Caroline KennedyHoney, get in line. Chris Smith: Caroline’s Quiet ReboundShe stayed home to watch Paterson on TV today. She’s skipping Sharpton next week. And she’s lobbying behind the scenes. 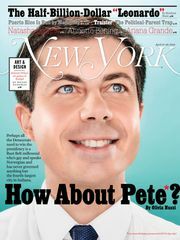 The Kennedy Mystique Still Failing to Sway New YorkersWe now want the guy from the other dynastic political family. Cuomo Aide Quietly Fighting on Boss’s BehalfEven though Cuomo said he was staying out of the competition for Hillary’s Senate seat. Really, Nobody on Mustique Will Miss the NoelsNot the first one, the second one … the whole gaggle! Plus, Caroline Kennedy sassed the press even when she was 6. In the gossip roundup. Caroline Kennedy Making Opponents (Yes, They Exist!) Feel SmallFor an elegant stick figure, she casts a big shadow. Officials Tell Press Paterson Is Leaning Toward CarolineBut he is “still looking”! Is Paterson Beginning to Crack?As the pressure continues to build, the Cuddle Gov retreats behind his armor of humor.